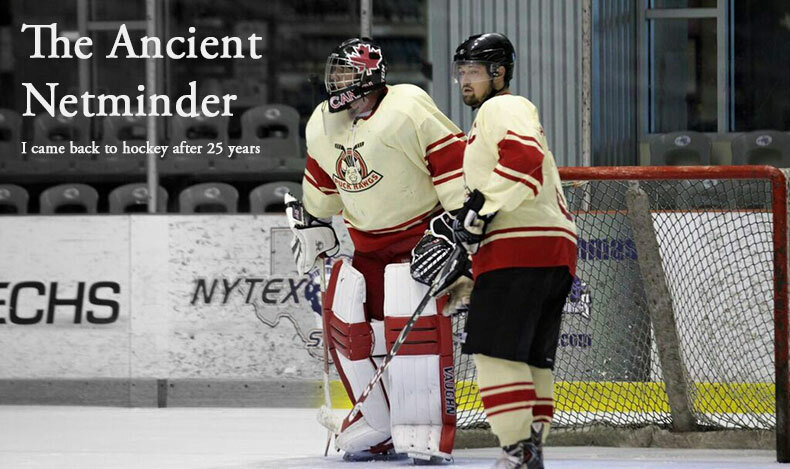 The Ancient Netminder: Skate! Skate! Skate! I am thrilled. I am anxious. I am intimidated. Today I visited my local hockey shop to buy some skates. I hatched a plan to discover if my days of playing hockey really were over. After talking it over with my wonderful and supportive partner, she encouraged me to take the first step of this plan and buy my first new pair of skates in 25 years. Some information here for those of you might not be aware that skates worn by goalies are quite different than those worn by forwards and defenseman. 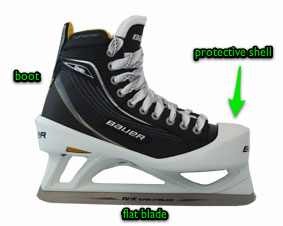 In fact, the blades on a goalie skate are more like figure skates than hockey skates with a few important differences. Goalie skates, like figure skates, have a flat blade while normal hockey skates have a curved blade. Goalie skates do not have the toe pick like figure skates but feature a hard plastic, protective shell that surrounds the boot. "In fact, the blades on a goalie skate are more like figure skates"
Because my last skating experience had been with regular hockey skates and they had been horrible rentals, I had some hope that getting myself goalie skates that fit well would lead to a better evaluation whether my days of skating really were over. After all, I had played goalie my entire youth and never spent any time on regular skates. I tried on several brands and while trying to keep the budget small, my primary concern was finding a skate that fit well. I had always experienced foot pain from skating and I was determined that if I couldn't find a new skate that left me pain-free then this entire journey was going to come to a quick end. I ended up with a low-mid priced Reebok skate priced around $130. I vaguely remembered that I liked my skates on the dull side and so had them sharpened on the spot with those instructions.